For the last eight weeks on Great British Menu we’ve watched twenty four of Great Britain’s finest chefs battle it out. Now nine chefs including five chefs from Great British Chefs site are hoping to represent their region by serving at the special banquet for D-Day veterans at the end of the week. This week (starting 2nd June 2014) we will finally get to see who will go through to cook at St Paul's Cathedral. Here’s a round up of the chefs who will be preparing 21st century gastronomic dishes that are worthy of war heroes. Adam Simmonds and Tom Sellers jointly won the London and South East round; Emily Watkins will be representing the South West; James Durrant was the victor for the North West; Colin McGurran once again will represent the North East; Jacqueline O'Donnell won the Scottish round; Chris McGowan is representing Northern Ireland; Aktar Islam represents the Central region and finally David Kelman will be flying the flag for Wales. In Monday’s show the finalists prepare their starters, to be tasted and scored by the usual Great British Menu judges - Matthew Fort, Prue Leith and Oliver Peyton. They will be joined by D-Day veteran George Batts who helped to judge the North West round. All chefs will be hoping to make the top three shortlist for the banquet. On Tuesday it's the fish course and the judges are joined by Ken Sturdy who helped to judge the North West region. At the halfway point, the chefs who weren't in the top three on Monday will be doing all they can to make sure their fish course makes the shortlist today. With two course left the heat is on with main courses on Wednesday with the chefs hoping to impress the judges and Baroness Trumpington who worked as a cypher clerk at Bletchley Park. Of course it wouldn't be Great British Menu without a surprise element and today the chefs will discover that their own votes will make a big difference to the results. 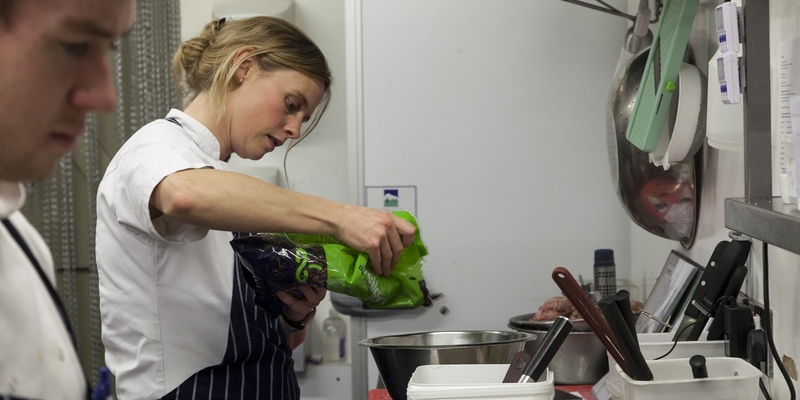 For Thursday's dessert round the remaining chefs will prepare their dishes for judges along with Winston Churchill's grand daughter, Celia Sandys. On Friday, the four winners will have been announced but the drama and surprises don't end as the final show follows the successful chefs in the run-up to the banquet. The pressure will be at fever pitch for what is likely to be one of the most important meals they will ever cook. Expect highs and lows as the chefs discover that the St Paul's Cathedral kitchen is not quite up to banquet standard. .
You can see the full line up of chefs and judges for the Great British Menu 2014 here. Plus don’t forget our special Great British Menu Recipe Collection. The definitive collection of recipes for Great British Menu fans, featuring old favourites like Lisa Allen’s Rabbit Turnover, Nigel Haworth's Lonk Lamb Lancashire Hotpot and Paul Ainsworth’s Taste of the Fairground, as well as newer classics from Great British Menu 2013 like Colin McGurran’s Tomato Gazpacho and garden salad.